Increase the size of the disk. Power on and run disk, removing the current LVM partition and recreating it to expand it to the new size (in my test setup, this is /dev/sda and the second partition, /dev/sda2). Reboot again, in order to make the kernel pickup on the new partitioning. I’ve been using Unix for quite a while. A few decades, actually. What goes in the file is the entire session, just as in a tmux log but a little easier to get it going. I’ll add it to my documentation toolbox for sure! This is just some notes regarding how to create a CentOS 7 performance test VM. Although I am working with Cloud technology professionally, personally I like to keep my services local. I really like being able to see the servers and disks that are processing and holding my data and I really enjoy setting up the hardware and configuring the operating system and the services running on top. Hosting services at home isn’t always that easy, though. One thing that usually simplifies things is to have a static IP. Another thing, at least if you want to secure your web servers with SSL certificates, is being able to have multiple IP addresses. Unfortunately I am currently stuck with a provider that offers neither to private customers so I have to make do with just one dynamic IP. Well, necessity is the mother of invention, so read on for the full story of my DMZ setup. So this is my new DMZ setup – a more technical write-up will follow. I’m really happy that the disks fits so nicely on the “shelves”. 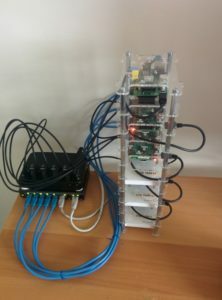 The “tower” comes from ModMyPi. Previously I was using grive, but it seems to have become inactive. But fear not! I found “drive”, which is a great CLI tool (written in Go, which is fun in itself!). Great stuff, great CLI setup and highly recommended! So I just made sure to have a symmetric up-link and down-link speed on my fiber connection (100/100 Mb/s). It turned out that my Thinkpad W530 (running Ubuntu 16.04 couldn’t keep up with the up-link speed – I just got around 20 Mb/s. Thanks to ArchLinux it turned out that this was partly solved by enabling antenna aggregation. I’m now getting at least 60 Mb/s which is not perfect, but acceptable. I didn’t spot this in time for my buy, but there seems to be a 20% discount on the Yubikey for GitHub users! Backing up is easy, right? There’s nothing more important than to make sure that your valuable data is backed up in the right way so that, when disaster strikes, you’re covered and get back to where you left off as soon as possible.